You can buy the album at here!! 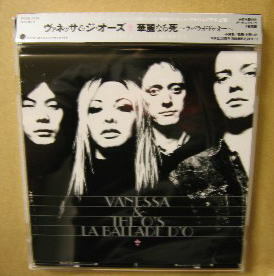 Vanessa & The O's played in Japan on 18th November!! Strange Days magazine's vol.100 Anniversary party, at Club Citta Kawasaki. But Niclas didn't come with the band this time, because he will be on tour with Peter Jöback. The show was an event of their lavel, Strange Days' paper magazine. Click here about the detail(but in Japanese..)..
*The photos are on Myspace! The Japanese version was released 24 May 2006!! 4 bonus track, Original cover, Japanese lyrics. "We All Love Ennio Morricone" with the magnificent lineup. This album's Japanese version also will be released from Sony records, on 21st March. They play "Je Changerais D'Avis" in this album, the original is called "Se telefonando"
It's so suitable for Vanessa's vocal, isn't it!? In fall 2003, Niclas and Andreas were released a single CD, with James Iha(ex-Smashing Pumpkins) and Vanessa Quin(French woman singer). 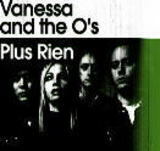 This project is called 'Vanessa and The O's'. The news is here(in English). And here(in Swedish) is an article in September 2002. Iha and Niclas were robbed by two other guys after a dinner at a Stockholm restaurant. No one was physically hurt but they were stolen 300 dollars. It also says they are working with a New York girl called Karen; Lou Reed also seems to be involved. Vanessa and The O's interview on Metro 13th May. The PDF file is too big to open, so I separate and up here it again. And there are new articles here and here.